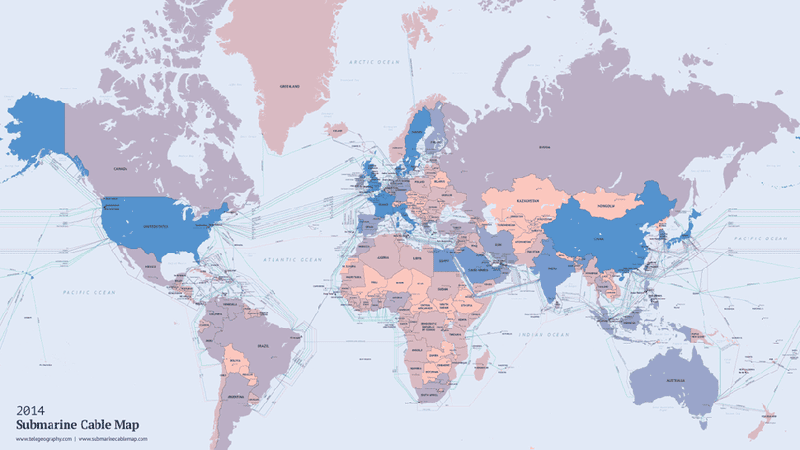 You may reach the internet via newfangled wireless connection most of the time, but all those ones and zeros cross the oceans the same way old-fashioned telephone connections did: by undersea cables. The map masters at TeleGeography have charted the course the internet takes to cross the seas in 2014, and the result is fascinatingly complex. Zooming in on the interactive map reveals some interesting conclusions. Australia and Alaska, by virtue of their remoteness, are served by a scant few connections, while the heart of Europe is a complicated tangle of internet tubes. 263 of these cables are currently active, with 22 more poised to come online by 2015. If you're a serious cartography fan, you can even order a $250 print to hang in your map room.